Its name derives from the Latin statio, meaning a post of duty and also has a penitential association, as for example in the station churches of the Lenten liturgy in Rome or the stations in the Way of the Cross-devotion. Many refer to undertaking the pilgrimage as ‘going on station’. 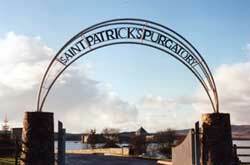 Station Island has been a centre of pilgrimage since at least the twelfth century. It was famous as such throughout Europe for several centuries thereafter. The famous Irish text- Acallan na Sanorach (Colloquy of the Ancients) explains the name of the lake (dearg- red) as derived from the blood of the last great serpent, which Patrick slew here. Some recent authorities prefer to read Derg as a form of the Irish deirc, making the name mean: the lake of the cave. Some form of cave on Station Island was the focal point of the pilgrimage until 1780 when a chapel replaced it. Until this period all the area around Lough Derg was termon land, an ancient sanctuary area. The modern village of Pettigo derives its name from the Latin protectio (protection), a translation of the Irish ‘termon’.